The purpose of this study is to create a standardized framework for evaluation of ulcerative dermatitis in Waldrapp ibis, with the ultimate goal of discovering the root cause of this condition in captive populations. This will be accomplished using a structured, multi-factorial approach that includes thorough analysis of skin biopsies, serology and husbandry. This research is supported by the Waldrapp Ibis SSP. The guidelines for the conservation and reintroduction of Waldrapp were established by the International Advisory Group for the Northern Bald Ibis. This group recommends that wild populations not be augmented by zoo-bred ibis. This decision is based on the prevalence of ulcerative dermatitis in zoo birds with no clear cause or treatment. As these birds are critically endangered, there is a fear that an unknown disease process could be introduced into the wild. The hope behind this project is that by standardizing testing of the birds and establishing a method of quantifying the skin lesions, the true prevalence of ulcerative dermatitis can be established. This project is the first study of it's kind in this species. The Northern Bald Ibis was once widespread across the Middle East, northern Africa, southern and central Europe. Currently, there are believed to be fewer than 500 wild birds in Morocco and fewer than 10 in Syria where is was rediscovered in 2002. Recent reintroduction programs have been instituted internationally with breeding sites in Turkey, Austria, Spain and northern Morocco. 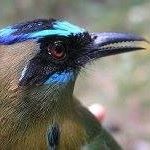 These programs helped downlist this bird from Critically Endangered to Endangered on the IUCN Red List in 2018. However, there is concern that genetic bottlenecking may occur without the option of maintaining genetic diversity by moving zoo bred birds into reintroduction programs. Especially since many of thee breeding sites are in war torn areas. Within the year, I hope to create a standardized grading scale to assess extent and severity of ulcerative dermatitis to implement across the SSP. This is done by using diagrams and photos to quantify dermatitis. Will use percent of body affected along with depth and size of ulcerations to set the grades. Data from husbandry surveys, dermatitis grading forms, bloodwork, and skin biopsies will also be analyzed to determine ulcerative dermatitis etiology. The bloodwork will potentially indicate any nutritional deficencies that may predispose these birds to skin disease. The biopsies will better characterize the extent of skin disease on a cellular level. With this information, we hope to improve the health of this species. This proposal seeks to address the issue of widespread ulcerative dermatitis in the North American Waldrapp ibis population by asking institutions to provide two full-thickness skin biopsies from each bird to a single pathology service. Each facility will be asked to provide blood samples from each bird to a single serology service. To eliminate variances in collection, storage, and shipping methods, protocols for each procedure have been established and will be distributed. Serum will undergo vitamin, mineral, and trace element analysis to determine any nutritional cause for this skin disease. Upon collation and analysis of all results, emerging patterns hopefully will be detected. The scope of this project is quite vast. There are 162 birds in the North American population. With this proposed budget, we will only be able to perform this initial testing on 25 birds, and we are continuing to search for additional funding sources. Skin disorders in many ibis species, including the Waldrapp ibis, have been prevalent in the taxa historically. Previous attempts to isolate/treat these conditions have met with very limited success. A definitive answer of the cause and how treatment could proceed to reduce or eliminate the issue would be highly valuable for the long-term management of the species under human care. Establish a grading scale for ulcerative dermatitis severity and create a husbandry survey for completion by participating institutions. Build out visual element of grading scale using pictures of affected birds received from participating institutions. Collate results of bloodwork, skin biopsies, and survey responses. Analyze data, identifying any emerging patterns that may indicate cause of ulcerative dermatitis. Publish results in appropriate scientific journal. The genus name, Geroticus, is derived from the ancient Greek meaning "old man" referring to its bald head. Eremita is Latin for "hermit" from the Greek meaning "desert" and refers to its arid habitat. The alternative common name for the Northern Bald Ibis is Waldrapp Ibis. Waldrapp is German for "forest crow".